BOM generation of all submodules in Gradle. When you create a common use library, which consists of many sub modules (artifacts), you probably would like to generate a Maven BOM (Bill of Material) file, so that you can avoid version declaration duplication. 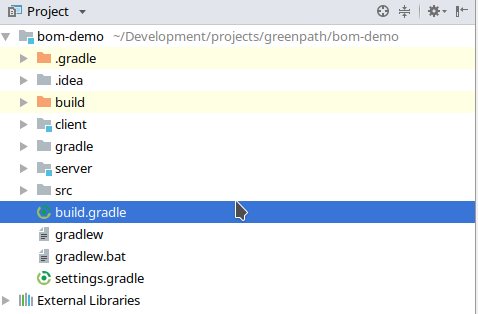 Doing it in Maven is quite straightforward, but in Gradle (as of today) it is not well documented and many Gradle based complex projects lack BOM file. Fortunately Spring IO Dependency Management plugin helps us with doing that. First you need to apply maven-publish and io.spring.dependency-management plugins. The first one will be responsible for BOM generation and the latter one will add a dependencyManagement DSL to define versions of your modules. Then you need to declare versions of modules in dependencyMangement section. We will add all gradle modules (subprojects) so that we are not forced to manually add each new module. Then, all we need to do is to declare maven BOM generation using maven-publish plugin’s DSL. We need to define mavenBom empty publication (without additional artifacts defined). I hope this going to help you create useful BOM files. Having BOM’s it is easier to keep track of project’s dependencies and to enforce consistent versioning across applications you create. Recently Kernel 4.17 has been released. It has a major power consumption improvement so I decided to check it out now, before it is officially supported in Ubuntu 18.04. 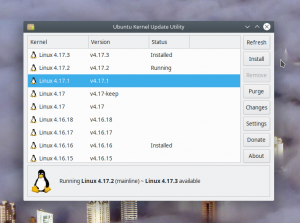 There is a nice tool to do the upgrade on Ubuntu, it is called ukuu. Then you are ready to go. All you need to do is choose the right version (4.17.2 in my case) and install it. After reboot you should see the new kernel. The kernel seems to be very stable. I didn’t see any problems since the upgrade.